Angamaly (Malayalam: അങ്കമാലി, Aṅkamāli) is a municipality in the Ernakulam district of the state of Kerala, India, and a fast developing satellite town of Kochi. Situated 32 km north of Ernakulam, the area is the northern gateway to the commercial capital of Kerala. The town lies at the intersection of Main Central Road (MC Road) and National Highway 47. MC Road, which starts from Thiruvananthapuram ends at Angamaly at its intersection with NH 47. Originally established as a panchayat in May 1952, Angamaly became a municipality in April 1978 and is also a Legislative Assembly constituency from 1965 in the Ernakulam district. The movie Angamaly Diaries is set in Angamaly. It is one of the fastest growing towns in Kerala, thanks to the proximity of the international airport, railway station and two major roads passing through. Angamaly serves as an entry point for various places of interest in central Kerala, which include Kalady, Malayattoor etc. With many villages surrounding it, it has become a major commercial hub. Angamaly is well connected by all means of transport. Kochi International Airport is in the vicinity of Angamaly. It is a matter of pride for the people of the Angamaly as certain regions in its jurisdiction are part of this project. Angamaly railway station, where all major trains stop, serves as a major connectivity point for people from the eastern side of the district to the rest of the country. There is a proposed railway line from Angamaly to Sabarimala, which will connect the high-ranges with the low land. Work is in snail's pace due to various regional and political issues. National Highway 47 connecting Kanyakumari to Salem passes through Angamaly. The NH 17 which connects Kochi and Mumbai is 20 kilometers from Angamaly. Main Central Road (M.C. Road) connecting Central Kerala to Kerala capital serves as an important road connecting many towns in the eastern side of the state. 'Manjaly thodu' which flows through Angamaly was a major waterway and Angadikadavu near the old church was an important trade centre in the olden days where spices, rice, bamboo and other agriculture and hill products were sent to the old port of Muziris. Manjaly thodu is part of the new National Waterways programme and is getting developed. Angamali is enriched with cultural and devotional centers. There are many old churches which are centuries old with well defined frescoes and other murals which are also famous for certain historical meetings and decisions that shaped the modern Christianity in the entire India. The new Catholic church built at the heart of the town is regarded as the biggest of its kind in India. Vembiliyam Mahadev temple, Paddupusha Bhagavathi temple, Thirunayathodu temple, Krishnaswamy temple, Venguru temple, Kidangooru temple, Kothakulangara temple, Jain temple, Elavuru temple, Muzhikulam temple are all famous Hindu pilgrim centres near to Angamaly. There are famous hospitals, and educational institutions which are pride to the local population. Angamaly has a state-owned industrial estate at its southern end which has numerous renowned factories. Kerala State Bamboo Corporation Ltd. has its headquarters at Angamaly. There are several small-scale cracker manufacturing units in the surrounding areas. Although recorded history does not exist about the origins of Angamaly, legends and local folklore attribute the name Angamaly to the grounds where battles (Ankam in Malayalam language) were conducted at a myal (attributed as a plain ground). Hence a very old battle ground. Another legend is that the word Ankamaly is derived from Akamaly I.e.inland port area. Several old coins and other artefacts found from the region tells this area was predominant with Buddhists and Jains in very old time. The 18 and a 1/2 viharas around Angamaly is a proof for this. Malayatoor which is famous Christian devotional centre is very near to Angamaly. It is said that St. Thomas, the Apostlate who was deputed to the region by Jesus Christ came via Angadikadavu in Angamaly using Manjali thodu to come from Kodungaloor port at AD 58. There are evidence for the churches in the locality built as early as AD 409 and AD 822. It was the headquarters of Mar Abraham, Assyrian-Chaldean Catholic Archbishop of Angamaly and Hind in the sixteenth century. Kalady, the birthplace of Adi Sri Sankara is only 7 kilometers from here, it is there the Sanskrit University situates. Historians records that a massive flood around the 16th century AD made the Angamaly river to change the course forced itself to flow through Aluva area. Now the river is called Chalakudy river and is the fifth longest river in Kerala. Meanwhile, the river in Angamaly became a lesser canal and there by got the name Manjaly thodu. The Angamaly Firing was an incident that took place in Angamaly, Kerala, on 13 June 1959, when police opened fire on protesters who had been demonstrating against Kerala's communist government. Seven people were killed resulting in the intensification of Vimochana Samaram, a protest against the then communist led government. St. Mary's Jacobite Syrian Church aka Marth Maryam Soonoro Cathedral is believed to be built in AD 409 and is the first church built in Angamaly. It is an ancient church and one of the most prominent churches in Kerala. 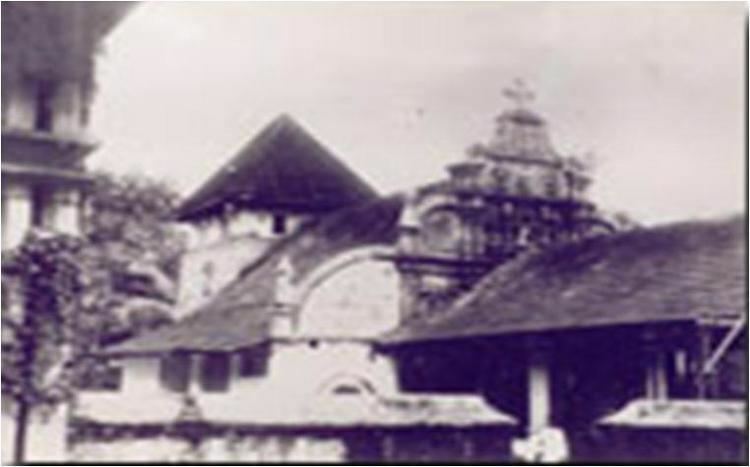 It was the seat of the Archdeacon, the local head of the Malankara Church and hence held an important position in Malankara for many centuries. St. Thomas Syro-Malabar Catholic Church, Malayattoor – St. Thomas is believed to have landed in Kerala at Kodungallur (Cranganore) in AD 52. It is believed that St. Thomas held prayer at this church when he landed in Kerala. Oral tradition says that while travelling through Malayattor, faced with hostile natives, he fled to the hilltop. The Christian pilgrim center has been designated by the Vatican as an International Shrine. Kodanad – famous for its Elephant Training Center is 25 kilometers from Angamaly. Elephant ride as well as a mini zoo is part of this. Mar Hormiz Syro-Malabar Catholic Church, Angamaly - Old Cathedral of Saint Thomas Christians. It was established in 1570 by Mar Abraham, the last Assyrian-Chaldean Metropolitan to reach Malabar Coast and the First Metropolitan Archbishop of Syro-Malabar Catholic ArchDiocese of Angamaly. It was dedicated to Hormizd, a seventh century East Syrian saint. Mar Abraham constructed his new Cathedral in 1579. St. George Syro-Malabar Catholic Basilica, Angamaly – The church was originally built in AD 450, was renovated to become the biggest of its kind in the South India. Mahagony thottam – very beautiful picnic spot in the banks of Periyar river is 27 km away. Kalady Adi Sankara Keerthisthambham, Sringeri Mutt complex and Crocodile Ghat are 8 km away. Thirunayathode Sivanarayana Temple – Built by Cheraman Perumal Nayanar in AD 800's. St. Mary's Jacobite Syrian Soonoro Cathedral – built in AD 409 have many ancient murals in its walls. Kallil Temple is a revered Jain shrine established from the 9th century. Kallil literally meaning "in stone" is a temple located in a vast expanse of 28 acres. This rock cut temple can be reached after a short trek up 120 steps. The temple is managed presently by Chenkottukonam Sree Ramadasashramam. It was originally owned by the Kallil Pisharody family and hence name Kallil Devi temple. Dedicated to Durga Devi, the temple has a structure of Brahma carved at the peak of the rock. The triad of Brahma, Vishnu and Shiva are all worshiped in this temple. This shrine also enshrines Jain deities namely Padmavati Devi (worshipped as Durga Devi by devotees), Parshvanath and Mahavira. It is believed that Kallil family had once followed Jainism. It is 26 km from Angamaly. Angamaly_Diaries - Tells the story of local people and their life at Angamaly. Transformers And Electricals Kerala Ltd.(TELK) is Located in Angamaly, producing and setting up High Voltage equipment in the region. Started off as a technical and financial collaboration between Govt. of Kerala and Hitachi of Japan, now it is a JV between Govt. of Kerala and NTPC Limited, TELK manufactures Extra High Voltage Power Transformers (up to 315 MVA, 420 kV) and other equipment (CT, PT, Bushings) up to 420 kV class. The industrial estate is located in Angamaly South. Angamaly assembly constituency is part of Chalakudy (Lok Sabha constituency). As of 2011 India census, Angamaly had a population of 33,465. Males constitute 49% of the population and females 51%. Angamaly has an average literacy rate of 88.15%, higher than the national average of 74.04%; 9% of the population is under 6 years of age.religion-christianity-71.89%, hinduism-27.03%, islam-0.83%. Little flower institute of medical science and research.